Today we present the first draft of a series of new figurines modeled 3D. 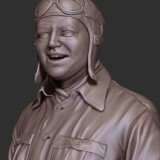 It shows Boleslaw Orliński, the famous pilot of PZL. It will complement a series of models of aircraft PZL P.1-P.6-P.8 from Arma Hobby. Zouaves of Death is a legendary and feared formation from the Polish January Uprising against Russians in 1863. In the next few days it will be offered from Adalbertus a figure depicting Polish Zouave in 54mm scale. See the historical background and learn more about the figure.